Realising UCEM’s sustainability potential goes beyond addressing day to day operations, to recognising our position to influence and educate industry professionals who design, develop and manage the Built Environment. Delivering academic excellence is one of UCEM’s primary goals. 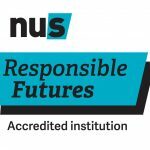 UCEM is delighted to have been awarded NUS (National Union of Students) Responsible Futures accreditation, which is valid for two years up until Spring 2020. The institution became the first alternative provider to be awarded the accreditation – which demonstrates UCEM commitment to promoting sustainability and social responsibility – after a two-day audit carried out by UCEM students who had been trained by NUS.